As all my family are coming for Christmas this year I am starting to plan decorations and food etc. A few things I have been thinking of getting was some large glass jars to put candles in to dot around the outdoor area and a larger candle candelabra than the one I already have. Well what do you know...on visiting a couple of garage sales on Saturday morning I found a box of large glass fowler jars and a candelabra!!! Also a couple of other things that might make an appearance at Christmas time! The candle holder for $2....I will give it the white paint treatment! And a few other things for $3. I'll also give the basket a spray of white paint. This old 'Church' vase...that's what I call them as that's what the ladies always used at Church for their beautiful flower decorations! I might create a Christmas arrangement with gold painted branches and some sort of simple decorations...need to think about that more. Here is a shot of my wheelbarrow by the back door. The petunias are starting to flower nicely. On the weekend I planted lobellia's amongst them, so by Christmas time it should be full of colour. 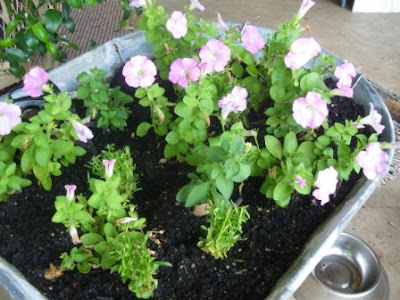 Your petunias look lovely, mine are not as advanced, I need to get some more. Putting the candles in jars is a good idea, they don't get knocked over then. Love your wheelbarrow,it will be stunning on Christmas Day. Love your "church" vase. Happy days.